Bring corn sugar and water to boil. Cool for 10 min and add to beer. Stir slowly. Let settle 10 min. Bottle. Cold crashed beer for two consecutive nights by leaving the carboy wrapped up outside. Temps probably got down into the low 40s 'F. Allowed to warm to low 60s 'F before bottling. Appearance: Nice clarity, black with garnet red hue at angle. Aroma: Faintly burned chocolate, all spice comes through afterwards, perhaps some floral hoppiness. Taste: Much hoppier than last year, also MUCH more bitter. This may come from too much black malt. Bitter chocolate flavors, not as sweet. This beer may actually border on a black IPA's bitterness. Very dry. Perhaps ferment warmer next year, or do a multi-step mash to enhance mouthfeel and maltiness. Next year: Scale back on cascade hop addition, perhaps by 0.5 oz. Increase caramel malt for more residual sweetness. 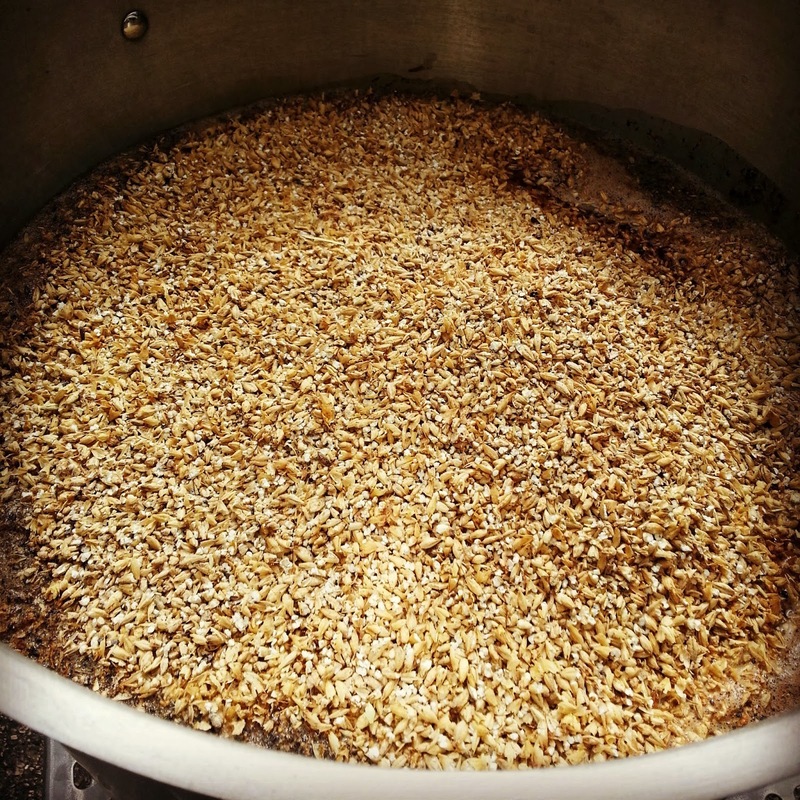 Consider fermenting warmer or a step-mash to accentuate maltiness, mouthfeel. Racked beer to secondary. Appearance is very cloudy, opaque. But flavor is amazing! Really nice bready, biscuit malt flavors balanced against a spicy hop bitterness. Batch sparge with 3 gal water @ 168'F. Rest 10 min. Collect runnings. Bring to boil and hop at designated times. Chill to 76 'F and pitch yeast. Let sit two hours. Chill to 64 'F and ferment. With lid half-on, boil evaporates approx 1 gal per hr. Post-boil: Collect 4 gal without tipping boil kettle. Collected 5.5 gal wort total. Dead space in megapot = 1 gal. Attempted to recirculate cold water for chilling wort using my steel head pump. VERY slow going. Need to purchase sump pump for this, while using my steel head pump to recirculate the wort, creating a whirlpool chiller effect. I've been wanting to make a hard cider since I first started brewing beer. I am finally getting the opportunity this fall. The wife and I get our apples from Door Creek Orchard just outside Madison and, as it happens, they sell unpasteurized apple cider. So I picked up a couple of gallons. 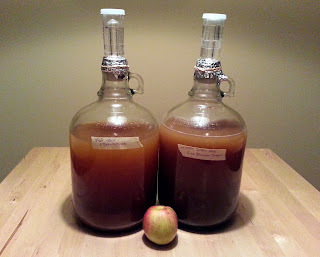 Using a couple of 1 gallon glass jugs as carboys, I decided to try splitting the cider into three different batches: One intended to be sweeter fermented with an ale yeast and brown sugar, one dryer fermented with wine yeast, and one left alone to ferment on its own wild yeast. Since the cider is unpasteurized and I didn't pick up any campden tablets to kill bacteria or suppress the wild yeast already in the juice, I decided to heat the cider to a simmer for about 10 minutes to pasteurize -- but hopefully not set the pectin and get cloudy cider. We'll see how it turns out. 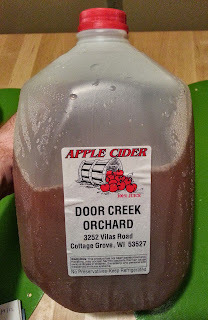 As for the wild yeast cider, I'm just crossing my fingers that I get something even remotely drinkable, or at least apple cider vinegar. I did a preliminary gravity reading on the raw apple cider: OG 1.044. Add brown sugar and nutrient to cider and heat to simmer for 10 min. Chill to 80 'F and pitch yeast. Ferment at 65 'F. 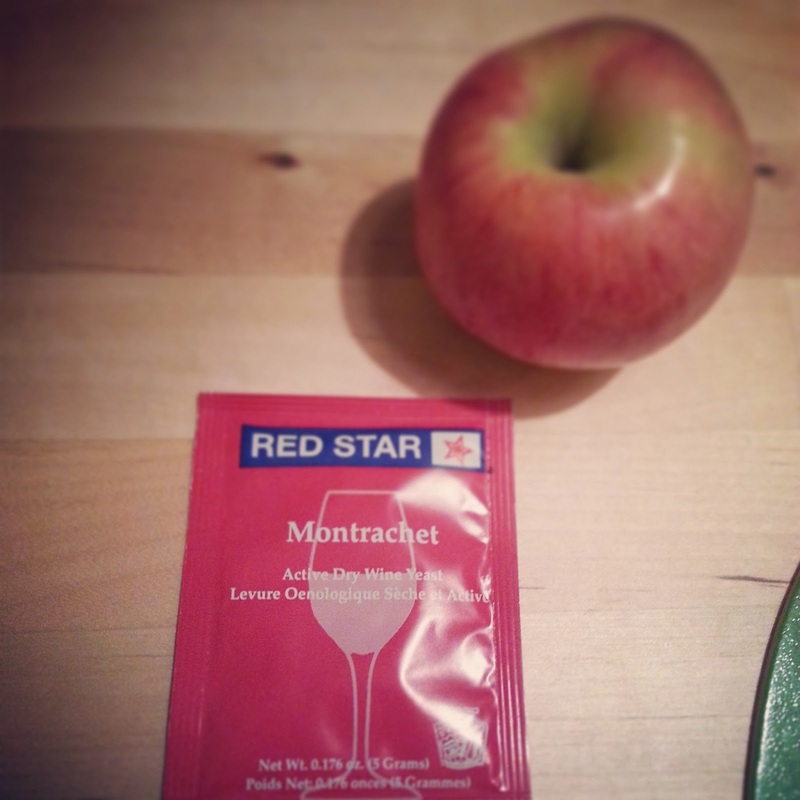 Add nutrient to cider and heat to simmer for 10 min. Chill to 80 'F and pitch yeast. Ferment at 65 'F. Transfer cider to sanitized growler, cover with tin foil, ferment at 65 'F. First and foremost: Figure out how best to chill the wort without using so much water. It felt like I was running the hose for 20-30 min trying to get the wort down to pitching temperature. This wouldn't be so bad, but my street has no curbs or gutters, which means the water ends up making a swamp out of my yard. Possible solution: Put 2-3 frozen gallon jugs in a tub of water, and pump this through the chiller using my steel head pump. I'll need to get some hose connections for the pump. I definitely need a cheap 5 gallon kettle for heating sparge water. My old 3 gallon pot just wont cut it on a full five gallon batch. Until I get this, I will need to heat the sparge water in my second 10 gallon kettle, then empty it into two other pots before collecting my initial wort run off. I need a table or workspace to rest utensils. A simple solution would be to attach sheet metal to the center of the brew stand to act as a table top. Additionally, I should attach sheet metal around each burner to act as a wind guard and to focus the heat on to each kettle. Hopefully this will also improve heating consistency. It felt like I was constantly adjusting the flame to stabilize my temps. 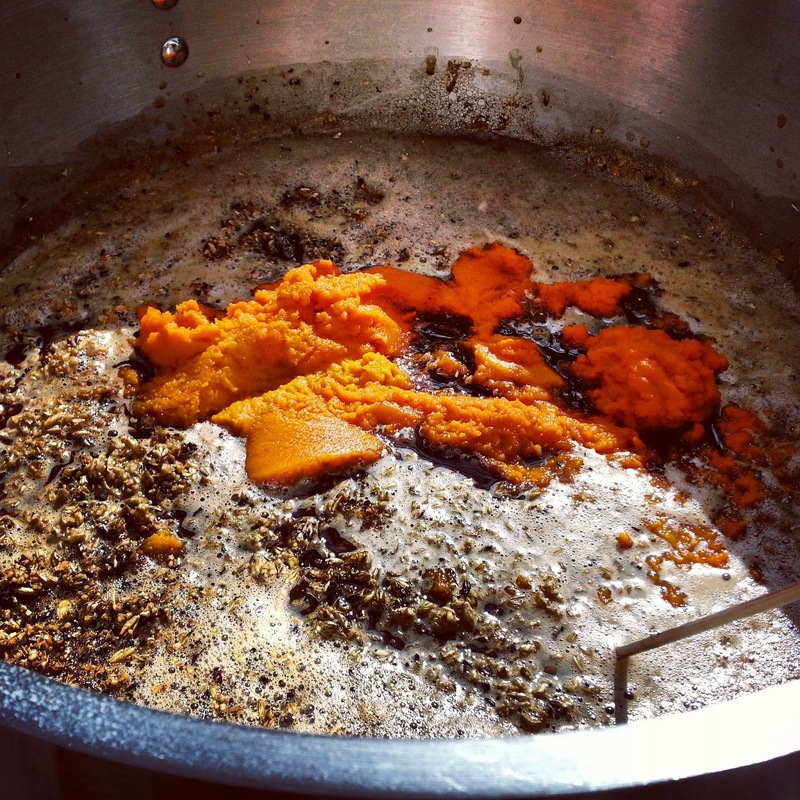 Love the beautiful pumpkin color against the mash! ﻿﻿It may have been biting off more than I could chew for this first go around, but I decided to brew my pumpkin porter from last year converted from a partial mash to an all-grain. That meant some educated guesses about the grain bill and efficiency on the new stand. 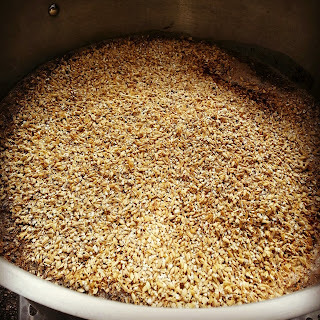 In the end, my efficiency was way low -- maybe 69% -- and I was working hard to wring enough runoff from my grain for an appropriate 5 gallon batch. I'll need to do a much better job calculating grain absorption, dead space, and evaporation need time around. I really need to calibrate my Beer Tools Pro software to my new set up. Added 0.5 gal water to fermenter to increase batch size to just under 5 gallons. Beer has more bitterness than I was hoping for. Cut back amount of cascade at 30 min?